The IMX decreased for the first time in six months, moving lower by 2.09 percent in October to 6.10, from 6.23 the previous period. 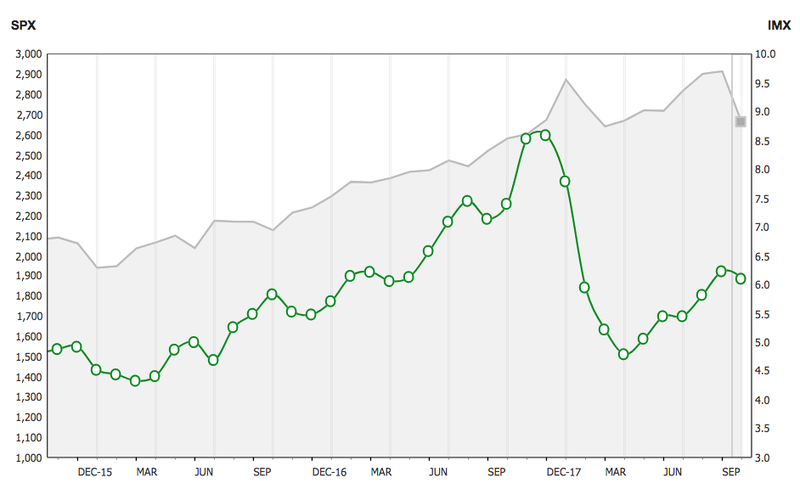 TD Ameritrade clients were once again net buyers during the October period, finding value in the market as overall volatility increased and indices moved lower. The reduction in IMX score was caused by relative volatility decreasing among widely held names, even as overall market volatility increased. Apple Inc. (NASDAQ: AAPL), Facebook, Inc. (NASDAQ: FB), and Microsoft Corporation (NASDAQ: MSFT) all saw their relative volatility decrease during the period, helping push the IMX lower. Volatility of the S&P 500, as measured by the Cboe® Volatility Index, or VIX, was up nearly 100 percent during the period. U.S. equity markets turned lower during the October IMX period. The Nasdaq Composite had the worst returns of the three major U.S. indices, and was down 10.9 percent. The S&P 500 and Dow Jones Industrial Average were also down during the period, 8.8 and 6.7 percent, respectively. Overall market volatility increased as investors focused on climbing bond yields, slowing global growth, and increasing trade tensions. The Fed minutes of the September meeting were released, which noted Fed officials see a strong economy and would continue to increase interest rates. Economic growth in China slowed to 6.5 percent, the slowest pace since the financial crisis. Despite slowing growth in China, the U.S. reported GDP growth of 3.5 percent.